Reviewers are regularly reminded until they remember to do as they promised me: Read my work. A list of assumptions, you might think, and I agree. It truly is. Now, however, the question is not how I experiment with my assumptions. As the world progresses towards more explorative ways of developing products, most entrepreneurs are going to get decent at experiment design and execution. Interview techniques, A/B-testing, landing pages, funnel analytics and so on will all be at our fingertips. Rather, the question becomes how I came up with these assumptions in the first place. The Argentinian cellist Sol Gabetta says her instrument is a part of her soul. Artists like her put an almost unbelievable amount of work into preparations. A performance it’s not about rendering the music sheets correctly – in order to engage with their audience, they need to pursue their own take on every piece they perform. This creative process is the hard part. 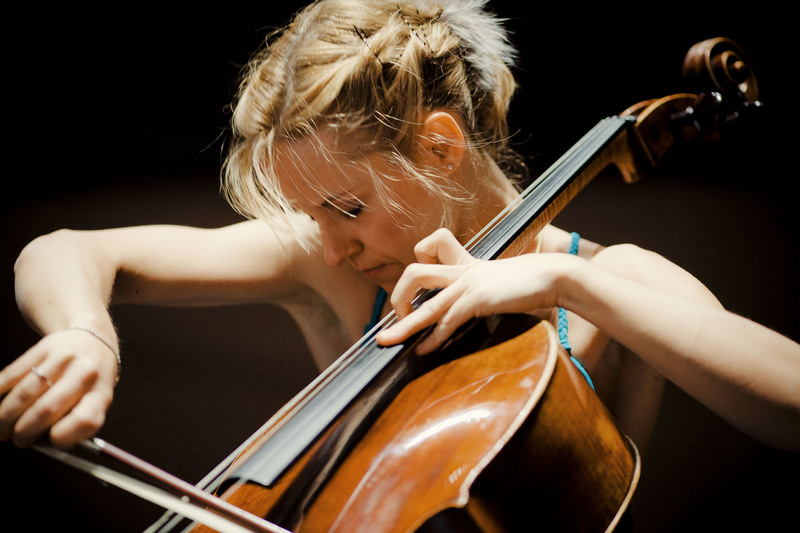 Sol Gabetta has an advantage over entrepreneurs: The music she plays has survived for hundreds of years. It’s validated, beyond any trickle of doubt, that it has value to someone. Hence, she may focus on performance alone. Entrepreneurs, on the other hand, who need to develop their ideas as well as validating them, risk doing mostly one or the other, simply because switching modes is too demanding. Lukas Fittl writes about this in his post The Ideation Switch. In his view, in addition to the build-measure-learn loop, you should also spend time on Ideation, where activities like Customer Interviews, Business Modelling, Index Cards, Personas, Design Studio, Rapid Prototyping, Customer Journey Maps, and more come into play. A number of things are going on when musicians study a new piece. They’re rehearsing to build muscle memory for a more confident performance. They’re developing an intuitive understanding of rhythm, phrasing, intonation and a number of other factors that ultimately makes the piece “a part of their soul”. It might sound like an obsession. It probably is. The time an entrepreneur spends speculating inside the building might not be 100% wasteful. While you program, tweak business cases, create wireframes, build mood boards or do whatever maximizes your creativity, you essentially rehearse your idea. You build “muscle memory”, you train rhythm and intonation. This process may take you faster to the assumptions it makes most sense to validate. Being a newbie author, I know what it feels like to have worked for too long on a text nobody has read. Simply knowing that someone actually read this crap, gives me energy to continue. That’s what the first version of Feedbackbook covered: Reviewer tracking. No login, no ability to comment, no chapter rating. The only feedback an author would get, was how far a reviewer read before he fell off. But my solutions worked. I didn’t fake anything: I programmed a document parser, I had a database, and I even made a simple dashboard for the author. And the fonts and colors were nice (I used a CSS Framework), and a reviewer would get started reviewing by tapping his smart phone once. Working on this first feature, prototype, MVP or whatever you choose to call it, also helped me understand my vision: Feedbackbook is here to spark writing energy. It’s not really about feedback (although the feedback most likely will be crucial to the author’s success). This insight was a step up on what I call the consistency scale. When working on behalf of an investor, it gets worse. We constantly have to switch between focusing on how we spend someone else’s money, and nurturing your own creativity. From our rational self, to your soul, and back again. It’s easy to get stuck on either side, making you either too rational (you only care about doing it “right”) or too detached (you work in splendid isolation, and burn your funding on the wrong ideas). I’m solving my own problem (as much as I hate to admit it, there are few other persons in the universe I empathize with more than myself). I solve this problem in collaboration with other people I assume to be like myself. I’m using programming as a means to reach insights (and I consider the working software in production a by-product). I allow my self to spend days and weeks in solitude, not months. Validated learning is still how I measure progress. No programming without a business model. I evaluate it frequently, by using feedback from all users including myself. I consider myself in trouble if I for some reason stop using my own product. I’m still facing the risk of (very effectively) developing a product nobody (but me) wants. I would however face risk with the validation first approach as well. In that case, I believe there’s a risk of superficially validating and invalidating both the wrong and the right assumptions. I might lose direction, I might give up prematurely, I might even find an out-watered product that barely makes it (and call it a success). 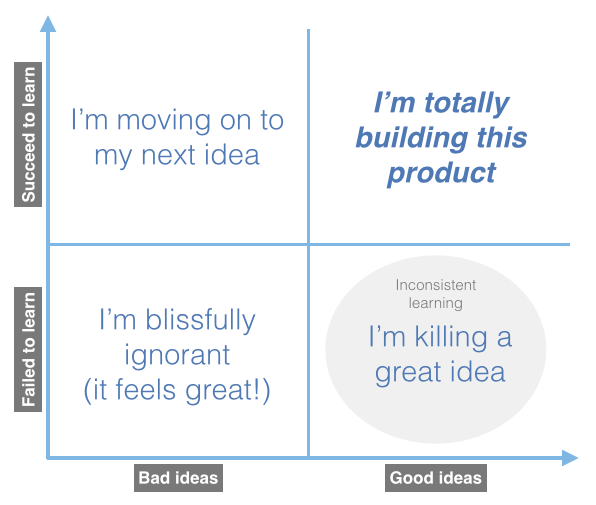 In other words: I can’t really tell whether my idea is good or bad before my assumptions reach a consistent level. This consistency level is in itself a collection of assumptions. An epic assumption, if you will. Right now my epic assumption with Feedbackbook says I’m not building a tool for writing: Authors should keep using their favourite word processors. More importantly: The feedback facilitated by Feedbackbook shouldn’t get in the way of the author when they’re writing their way towards consistency. (Keeping their working copy clean from comments, changes and other kinds of feedback). I might be wrong. Maybe Feedbackbook should be a word processor, but before I reach something consistent that can be tested on authors over time, rapid experimentation will not to tell me either way what’s right. I won’t know if my negatives and positives are false or true. (I could experiment with landing pages or mockups illustrating versions with and without word processing, but wouldn’t know how to design these mockups consistently enough to tell if an experiment actually validates or invalidates them). 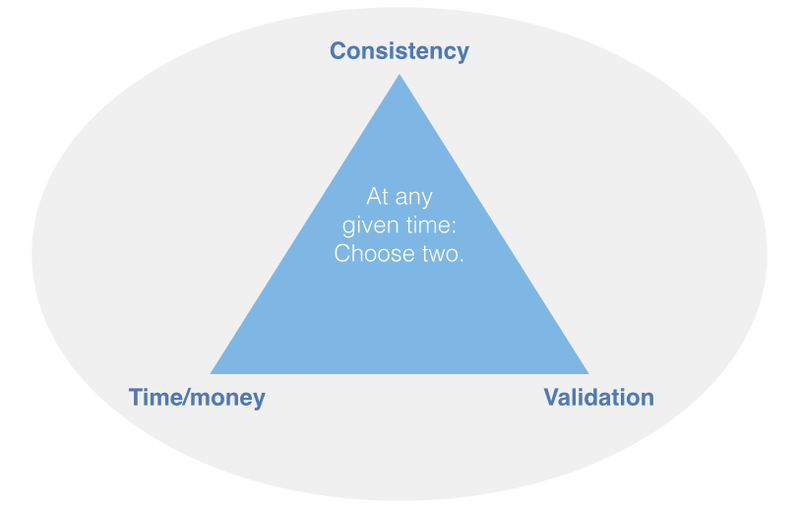 You could argue that any Lean process should have some slack built in (time you spend on anything you want), and that’s how you cover the consistency part. This however, makes consistency a second class citizen, because you’re only “allowed” to work on it on your “spare time”. That in turn makes validation the only first class citizen, which in turn makes validation a silver bullet. Gut feeling, intuition, luck, creativity and other seemingly “unscientific” qualities may be more important than we think. Actually, I believe all these traits are very scientific (don’t tell me Einstein missed out on any of them). I believe Eric Ries is right when he says everything an entrepreneur does is an experiment. This however, does not imply you should experiment with everything. You simply don’t have the time. When the experimental approach transitions from being a competitive advantage to a prerequisite for competing, our soul might get crucial again. Anders Haugeto (36) is software engineer, experiment designer and entrepreneur helping the customers of Iterate innovate faster. He shows intrapreneurs how lean thinking helps their mission in life – disrupt yourself from within.